Hi Friends: Here's my second project with this really cute AKC set Corgi 2017 With Pug Friend from JessicaLynnOriginal stamps, Remember, this set is available for pre-order with free shipping until the release date on 2/25/17. I had lots of fun stamping and making the tags for this card, but had a harder time achieving the look I had in mind for the overall card. I tried a couple of different background papers that I thought would work, and I really didn't like them at all. That usually doesn't happen for me, because I usually select papers first, then color my images to match. But with these cute puppies, I colored first, then selected papers - that seems a lot harder for me. But I found these papers that had the exact color of green in my grass, with hints of the blue in the sky and I think they worked. Please visit all of my design teammates and see what they've done next with this cute stamp set. Don't forget, if you decide to purchase any stamps or digis from the store, please remember to put my name in the instructions/comments section during checkout. Thanks for joining me for another look at this Corgi set! Have a great day! Stamp the Corgi and Pug image onto Ultra Smooth Cardstock with Memento Tuxedo Black ink and color with Spectrum Noir (SN) markers. Use a stippling technique for the fur. 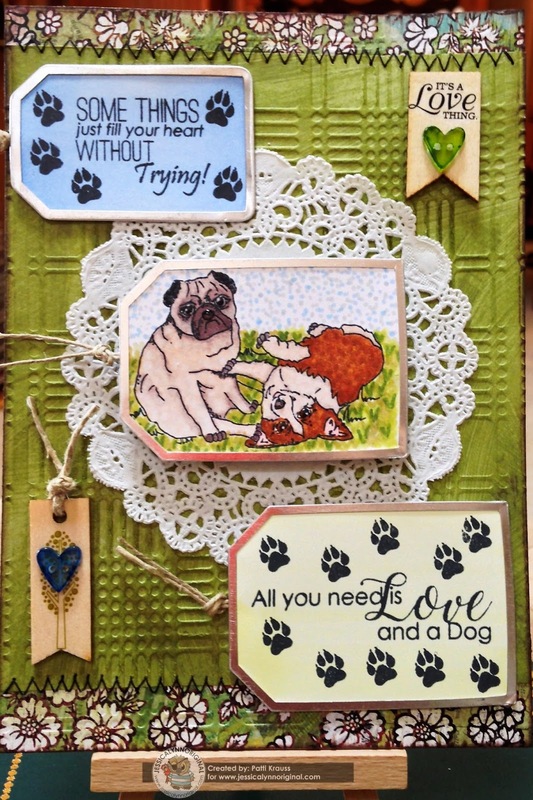 Add Glossy Accents for some shine and dimension on the Pug and Corgi's eyes and noses. Use the Tag punch to cut out the image. Stamp the sentiments and paw prints onto the smooth cardstock and use the Tag punch to cut out the larger tag and use the tag template to trace and cut out the smaller tag. Add the tags around the image/sentiments and use the Tag Maker tool to crimp them. Color the sentiments with the blue and green SN markers. Cut the background papers to fit the A7 card and stitch edges with sewing machine. Use the Plaid embossing folder to add texture to the background paper and accent the raised portions with Peeled Paint ink. Glue the background paper to the card base and add a doily to the center. Ink card edges with the Prima chalk ink edger. Add jute to the backs of the tags and to the wood tag - glue the sentiment tags and wood tag/banner to the card. Use craft foam for dimension and adhere the dog tag to the center of the doily. Add rub-ons to the wooden embellishments. Color heart buttons with SN markers and glue to the wooden tags. It's such an amazing card, Patti!